As we promised to you, we are launching the next step of the 10th anniversary event on Toluna.com! You can discover right away the following steps by clicking on this link: Ready, Set…Test ! Wish us and your fellow Tolunians happy birthday and share your message on Toluna – it can be a video (from Youtube, Dailymotion or Vimeo), an opinion, a profile picture – the more creative the better! Only Toluna members who create a birthday wish can take part in the special game we will launch on Toluna. Every week (usually on Monday) we will post a picture on Toluna in which we will “hide” 10 products – 9 usual product tests and one special high-value product test. Find the product you want to test as fast as possible and comment with the name of the product and its location in the room (example: on the table ) and the link to the birthday wish you created on Toluna. We will post the picture of the week on our fan page and on our Blog where we will give you clues of what the products are and where they are placed in the picture. This game is reserved for active members of Toluna who are above the age of majority in their state/country of residence and who have their profile completed at 100%! You can only participate once in each picture. You can choose if you want to play the game and become an instant tester for one of the 9 usual test products hidden in the photo or if you want to continue to the next stage of the game and become a potential tester for the high-value product. Be the first Toluna member that finds one of the 9 usual test products hidden in the picture. Comment properly with the name of the product and its location in the room (example: on the table ) and the link to the birthday wish you created on Toluna. If both conditions are met we will send you the test product right away! Find the high value product hidden in the photo. You then have 3 days to gather the most votes for your birthday wish. 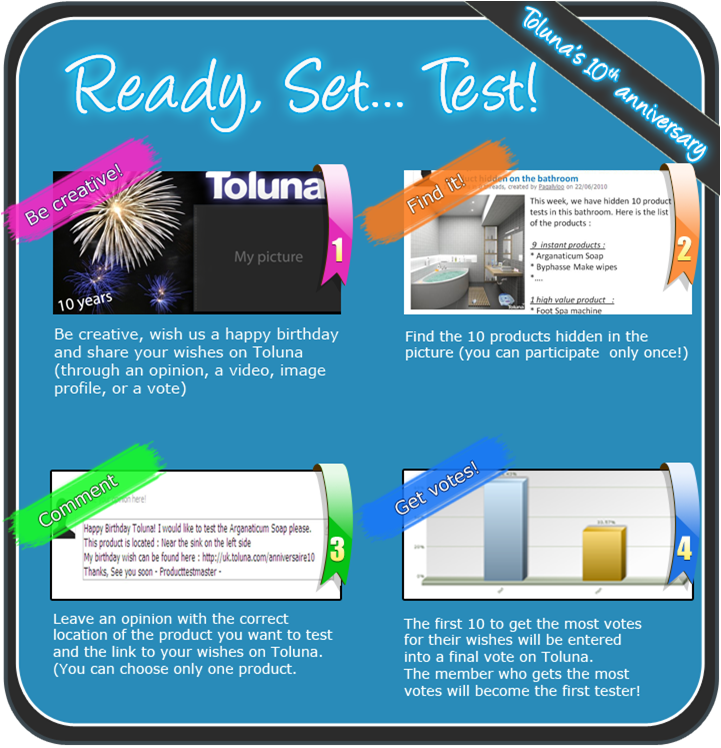 The first 10 members who comment properly on Toluna will be selected for the final. We will then ask the Tolunians to vote for their favorite birthday wish amongst the 10 selected and the member who gets the most votes will become the first tester of the high value product! Note that you can become a tester only once for the instant product tests and once for the high value products throughout the 10 weeks. You can also find all the details of this special event on our album named “Toluna 10th anniversary: Ready, Set …Test!” on our Facebook fan page.